Not so many beacon articles can be found on the web where everything is well explained and documented regarding the home-brew beacon design for the microwave frequencies. One of the authors who really care about it is Matjaz Vidmar S53MV. All his projects are well described, proven in practice, and all assembled from the cheap and wide spread electronic parts. The most important, they are working ! Between all of his numerous design, the beacon for the 23 cm band is one of the simplest microwave project. The project was published years ago and can be found in the script "Beacon 99" (PDF format) on the following address: http://lea.hamradio.si/~s53mv/beacon.pdf . 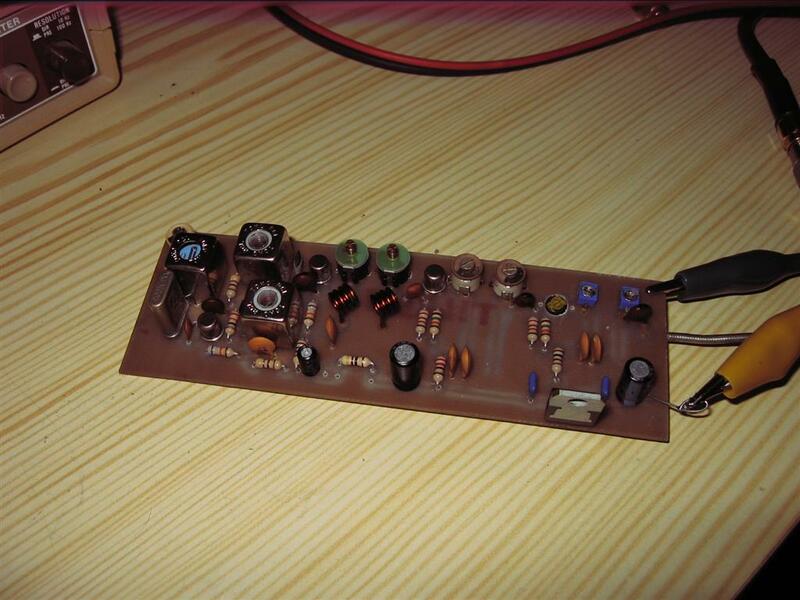 The design is straight forward, 648 MHz oscillator and 1296 MHz multiplier with small amplifier. All beacon was assembled on only two 0.8mm FR4 PCB. 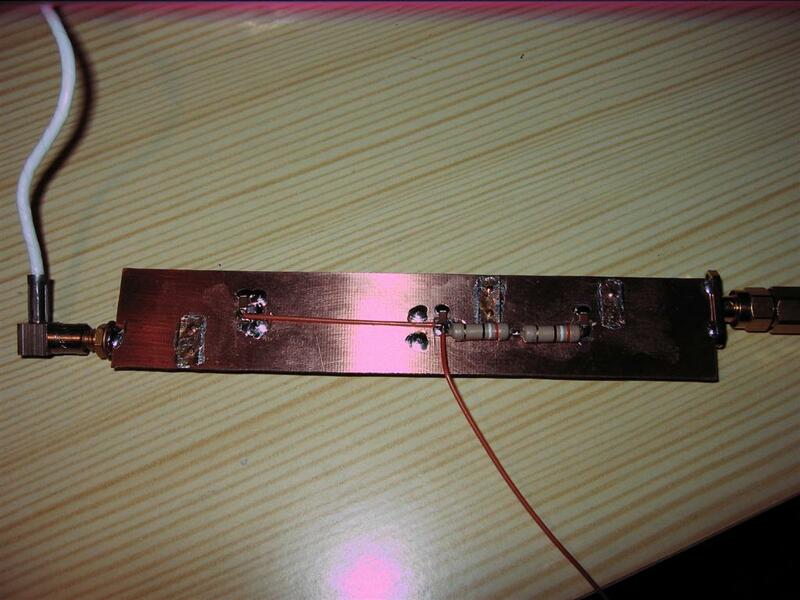 The oscillator PCB is single side and the 1296 MHz doubler PCB is double side with one side used for the ground. If you strictly follow the design and instructions there should be no mistake. The 1296 MHz multiplier is a no-tune design, so plug and pray. The 648 MHz oscillator board consists of the chain of multipliers where each one should be tuned to the exact frequency to obtain the good signal on the output (10dbm). As I already build the 648 MHz oscillator for the 1296 ZIF SSB TRX (in the same script) I decide to use this one for the beacon with the main crystal frequency on 18 MHz. The signal on 648 MHz was stable and the power was higher than 10 dBm. 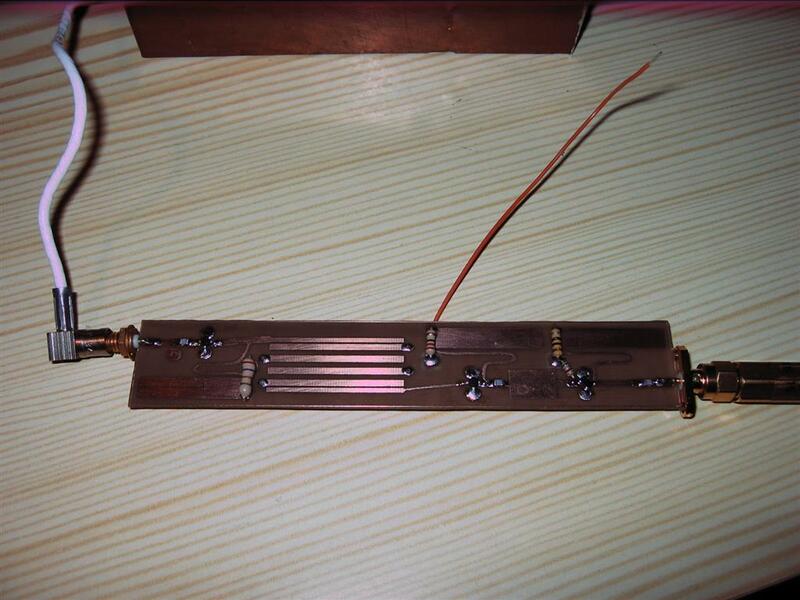 Frequency can be adjusted through the multi turn trimmer feeding the voltage to the varactor diode. With the cheap computer grade 18 MHz crystal the range 1295.900 - 1296.100 MHz was obtained with no problem and stable output power and frequency. Attention should be used when tuning the trimmer capacitors. Each multiplier stage, from the oscillator upward, should be tuned to the maximum power at the same time controlling the frequency of the multiplier stage that we are tuning. That way no mistake can be done and you should end with the correct output frequency. Instead of the 1st ATF35376 (multiplier) a MMIC SNA386 was used, modifying also the bias network. Both gate resistors are removed together with the LED diode with 330 ohm resistor and 10 ohms resistor was replaced with the 240 ohm. Standard MMIC multiplier configuration was used to double the frequency from the 648 to 1296 MHz. There was enough drive power to saturate SNA386 and to generate strong harmonic on 1296 MHz. Straight after the 4 pole strip line filter the first amplifier ATF35376 was again replaced but now with MMIC ERA-2. Gate resistor was removed and MMIC bias was adapted for the 12 volt supply. 4V7 diode was removed together with 180 ohm resistor and 10 ohm bias resistors replaced with 220 ohm. Of course, to complete the modification, the last amplifier BFP196 was replaced with the BFG540x transistor amplifying the signal to the +23dbm output with the power supply of 12 volts. Just a two things to take care when building this multiplier, the grounding MMIC and the output transistor via are just 3.2 mm holes closed from the ground side by thin copper foil. Tho holes are then filled up with the hot melted tinol creating good contact with the copper foil. Four filter stubs are grounded using the 0.6mm silver wire (one wire from the RG-214 center conductor). Bend the wire creating the C shape to allow good connection (2mm) on he top and the ground side of the PCB. Tight the wire with the pliers and solder the wire both sides. - up to now I build several oscillator boards for the frequencies of 576, 648, 720, 864 MHz and the only problem I had was the trimmer capacitor. After some time, the low quality trimmers are changing their value. The tuning point may be quite sharp on the second and the third stage, so this can cause that your oscillator after some time stop working, more often if your beacon is located outside, on the mast close to the antenna. The proper shielding is required as per article instructions and the beacon can be mounted close to the antenna to avoid the loss in the coaxial cable. The keying is done by means of switching the power supply to the 648/1296 MHz stage. The oscillator board is always powered to achieve the better frequency stability. I prefer to have the beacon not exposed to the atmospherics. The frequency stability is also less affected by the temperature if the beacon is held indoor. Of course, the loos in the coaxial cable have to be covered by extra amplifier to have the same power on the antenna. My beacon was built around standard 1H 17" rack together with the power supply and the IK0WRB beacon keyer. The keyed voltage is little bit lower than 12 volts. This result with the lower power output (100mW), but also the final transistor lower temperature. In the rack there is enough place for the extra amplifier and the inter-digital filter if required. I was surprised with the final frequency stability and the shape/sound of the signal. On the video, you can notice the second harmonic frequency received on the FT-817d accompanied with the W1GHZ 23cm transverter (high side injection). Keyed signal can not be noticed due to 50 ohm termination, and the frequency stability is not affected by the keying of the final stage. At the same time notice the power output on the power meter. The beacon was left on the bench for a couple of days connected to the dummy load. No significant change of frequency was noted nor the lower output power. After the initial beacon connected to the dummy load test, there was time to perform the "live" test running the beacon connected to the real antenna. The first antenna that I have handy and ready was the "Cheap WA5VJB" style yagi antenna. With some 10 dBi gain and indoor, connected to the beacon with a peace of RG-214 cable the antenna was pointed to the nearest mountain (1400 m ASL) from my home location. The idea was to use the already well known reflection point on the top of the mountain so the beacon can be heard in the near Italian provinces. The signal was good and stable, with no significant frequency drift. After several initial reports the beacon was switched off, ready to be mounted on the remote location. The beacon is planned to be mounted indoor, so quite long run of the coaxial cable will result the low power on the antenna with just a little bit more than 100 mW of the beacon output power. For that reason I add another 10 db amplifier stage at the end easy producing more than 1 watt of output power. The amplifier was mounted in the robust CNC machined aluminum housing attached to the bottom of the rack. The final result can be heard on the following video clip. Of course, 9A4QV/b signal is the strongest one between the two others.